Working with dates can be complicated. No matter the technology, developers do feel the pain. 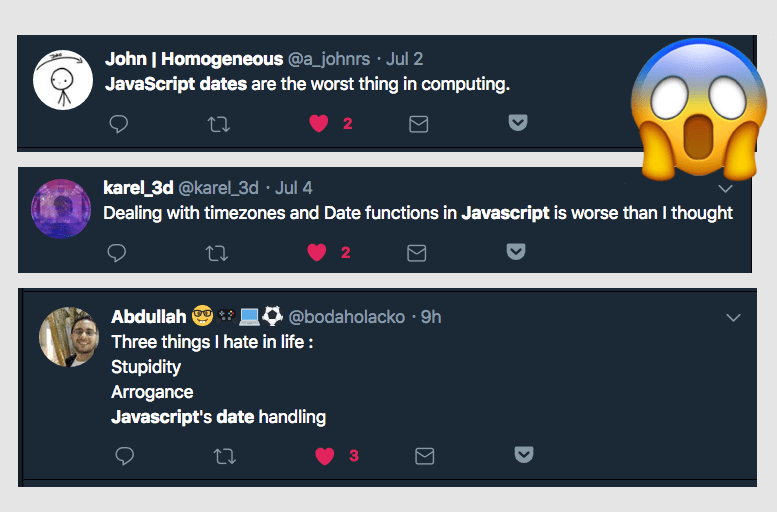 This article does not talk about Moment.js, which I believe it’s the best library out there to handle dates, and you should almost always use that when working with dates. A Date object instance represents a single point in time. Despite being named Date, it also handles time. This creates a Date object pointing to the current moment in time. Internally, dates are expressed in milliseconds since Jan 1st 1970 (UTC). This date is important because as far as computers are concerned, that’s where it all began. You might be familiar with the UNIX timestamp: that represents the number of seconds that passed since that famous date. There’s lots of flexibility here. You can add, or omit, the leading zero in months or days. Be careful with the month/day position, or you might end up with the month being misinterpreted as the day. Date.parse will return a timestamp (in milliseconds) rather than a Date object. In any of these cases, the resulting date is relative to the timezone of your computer. This means that two different computers might output a different value for the same date object. When initializing a date you can pass a timezone, so the date is not assumed UTC and then converted to your local timezone. date.toString() // "Sun Jul 22 2018 07:22:13 GMT+0200 (Central European Summer Time)"
date.toUTCString() //"Sun, 22 Jul 2018 05:22:13 GMT"
date.toDateString() //"Sun Jul 22 2018"
setDay and setMonth start numbering from 0, so for example March is month 2. Fun fact: those methods “overlap”, so if you, for example, set date.setHours(48), it will increment the day as well. Good to know: you can add more than one parameter to setHours() to also set minutes, seconds and milliseconds: setHours(0, 0, 0, 0) - the same applies to setMinutes and setSeconds. The same goes for months, hours, minutes, seconds and milliseconds. The Internationalization API, well supported in modern browsers (notable exception: UC Browser), allows you to translate dates. It’s exposed by the Intl object, which also helps localizing numbers, strings and currencies. new Intl.DateTimeFormat('en-US', options).format(date) //"7/22/2018, 7:22:13 AM"
new Intl.DateTimeFormat('it-IT', options2).format(date) //"22/7/2018, 07:22:13"
Here’s a reference of all the properties you can use. Keep in mind that getTime() returns the number of milliseconds, so you need to factor in time in the comparison. July 10, 2018 07:22:13 is not equal to new July 10, 2018. In this case you can use setHours(0, 0, 0, 0) to reset the time.